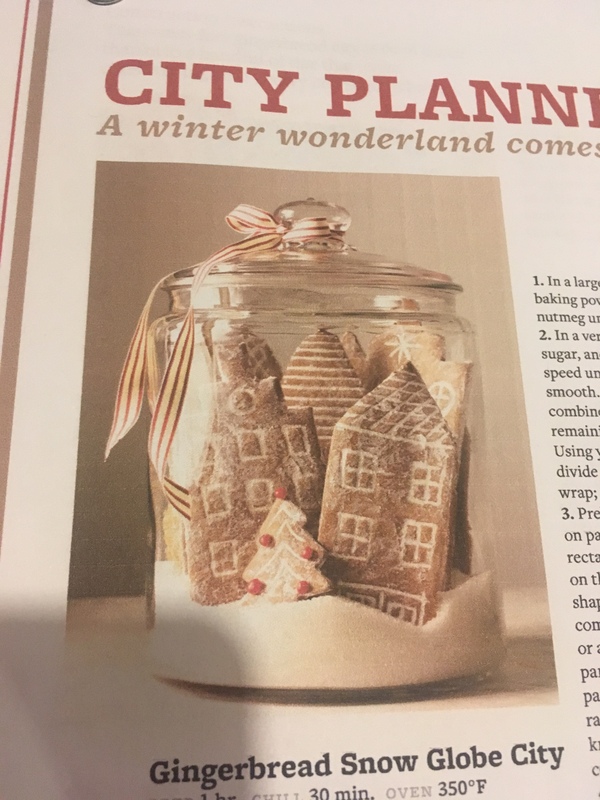 Thanks to a Pinterest post from Better Homes & Gardens, my friends and I each made a charming gingerbread village in a jar. 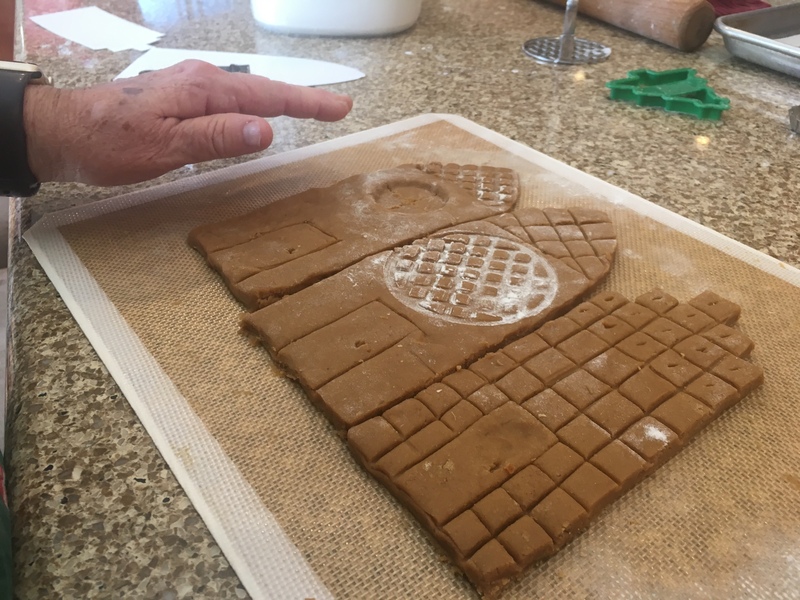 BH&G does a good job of explaining the process (https://www.bhg.com/christmas/gingerbread-houses/gingerbread-house-city/?ordersrc=rdbhg1107752), and the gingerbread recipe is delicious. Here is what BH&G’s gingerbread village looked like. Cute, huh? Martha, Kathy, and I strayed a little from the directions, and we have some advice based upon our struggles. Thanks to Dan the Man’s well-stocked kitchen, we had all the ingredients and tools we needed. 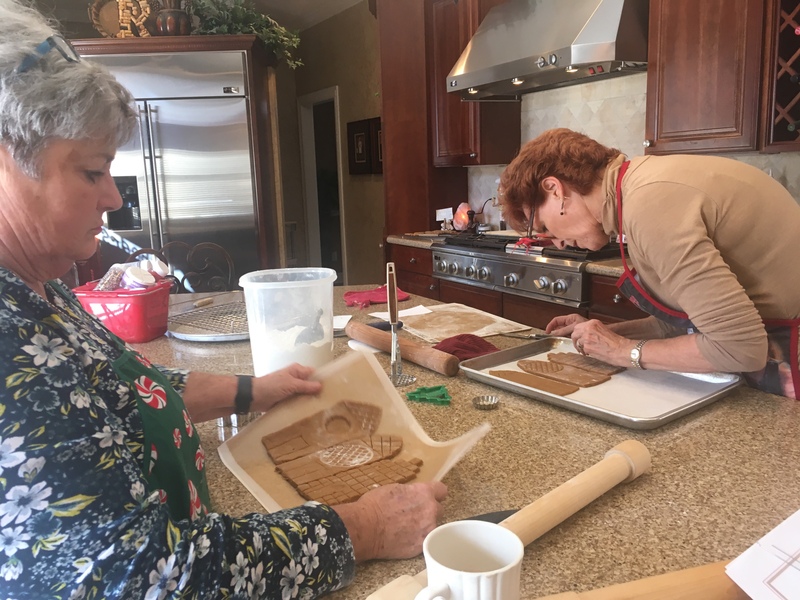 We asked for Chef Dan’s advice when Kathy started struggling as she rolled out the gingerbread dough. The dough was sticky and hard to work with. WORDS OF WISDOM #1: Chill the dough well. Flatten it, wrap it in plastic wrap, and chill in fridge for quite a while. 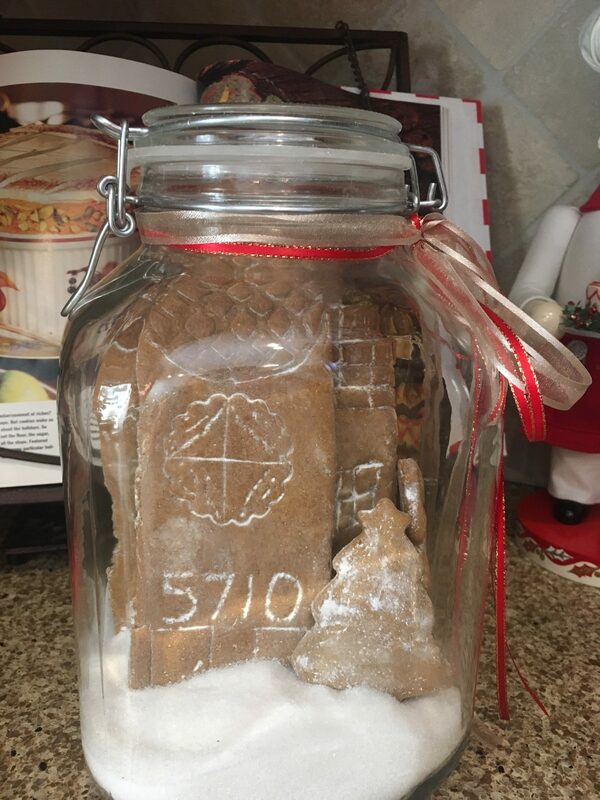 BH&G included templates for the houses, but we realized the templates were too wide for the jars we had. WORDS OF WISDOM #2: Make sure you measure your jar opening to ensure the houses will fit into the jar. 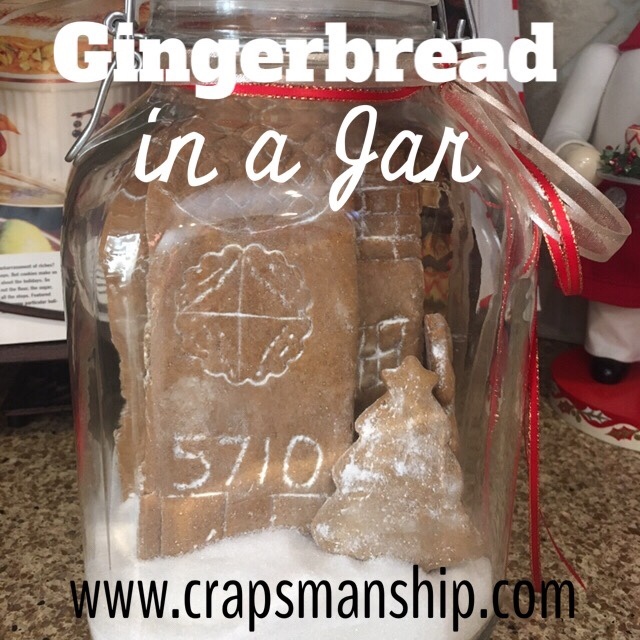 The gingerbread spreads a little as it bakes. The directions say to score the lines between the houses but not to cut them completely out until after they are cooked. WORDS OF WISDOM #3: We found that cutting the houses out completely and tearing the scraps away worked best (and, of course, cooking and eating the scraps!). The recipe directed us to bake the houses and trees on parchment paper. WORDS OF WISDOM #4: A silicone sheet worked best, and because I’m married to a pastry chef and we were baking at my house, we had plenty of Silpats! We decorated the houses before we baked by scoring our designs right into the dough. We used knives, toothpicks, a potato masher, and a small, round tin to embed our designs into the gingerbread. WORDS OF WISDOM #5: Be careful not to cut all the way through as you decorate. We struggled a little with the bake time. Martha took one pan out too late and over-browned her gingerbread. Kathy took one pan out too early, and the gingerbread house wasn’t sturdy enough to stand upright. WORDS OF WISDOM #6: Watch the bake time carefully, but err on the side of overbrown rather than underbaked. The powdered sugar dusting at the end of the process minimized the dark brown color. After the gingerbread had cooled, we dusted each piece with powdered sugar. WORDS OF WISDOM #7: Use a small pastry brush to remove excess sugar. This step ensures that the decorations pop. When we went to insert our houses into our jars, we found that our narrow-ish jars caused the houses to be stacked almost one in front of the other. Therefore, the houses in the back didn’t show very well. WORDS OF WISDOM #8: A tall, wide jar works best for display. As an alternative, vary the height of the houses so the ones in the back show well. A little ribbon on the top and the gingerbread village was ready for display in our kitchens. And the houses will be good to munch on when the holiday decorations are packed away.